Pound cakes are known for their dense, tight crumb and buttery flavor. While the original recipe called for a pound each of flour, sugar and eggs, there is more than one way to produce a cake with the distinctive texture. 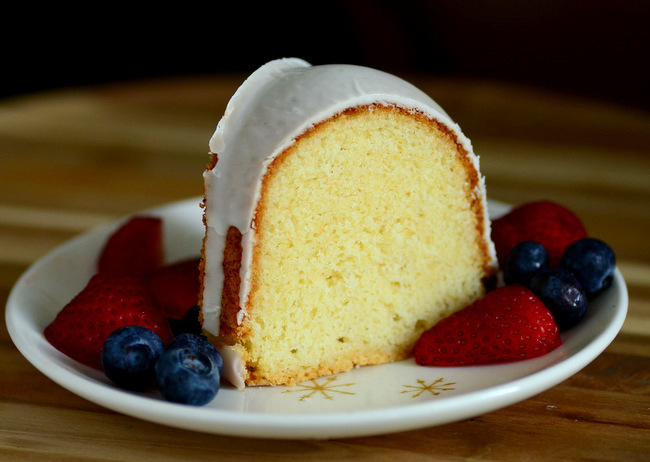 This Vanilla Whipping Cream Pound Cake is a fantastic cake for just about any occasion. It has a perfect crumb that almost melts in your mouth, a great vanilla flavor and just the right amount of sweetness. As you might guess from the name, this cake uses whipping cream as an ingredient. At the store, you might see “heavy cream,” “whipping cream” or both available in the dairy aisle.Â You can use either heavy cream or whipping cream in this recipe because the two products are similar enough to be interchangeable. Both heavy cream and whipping cream are high-fat milks product that can be whipped into soft, stable peaks. Whipping cream, by US law, must contain a minimum of 30% butterfat. Heavy cream, by law, must contain at least 36% butterfat. I generally use heavy cream because it seems to be more readily available at my markets, and recommend using that. The reason that you use cream in the cake is because all that extra butterfat contributes to an exceptionally tight crumb and tender texture. Making the same recipe with whole milk will yield a very good cake, but it won’t be quite as dense or have the same melt-in-your-mouth texture as one made with cream. And a pound cake is a great place to splurge with a little extra fat in the recipe, in my opinion.Â The cake will get a subtle fresh cream flavor from the heavy cream, as well, which really helps to amp up the vanilla flavor in the finished cake. I also used a combination of butter and vegetable oil in this cake. While it is more traditional to use all-butter in pound cake recipes, I find that using vegetable oil makes the cake a little bit more moist and less susceptible to over-baking – and it is always nice to have an extra buffer in case you leave the cake in the oven for a few extra minutes. Once it is done, the cake slices easily, revealing picture-perfect slices that are ready to be served up with fresh fruit, whipped cream or even a drizzle of chocolate sauce. The cake has a nice sweetness and doesn’t really need any frosting, but I added a small drizzle of vanilla glaze just to highlight the vanilla in the cake a bit more. Feel free to omit the glaze if you want to keep it simple – or opt for a dusting of confectioners’ sugar instead. The cake will keep well in an airtight container for a couple of days after baking. In a large bowl, cream together butter and sugar until fluffy (mixture will still be very sandy looking), then beat in vegetable oil. Blend in eggs, one at a time, followed by vanilla extract and mix until completely incorporated. Stir in half of the flour mixture, followed by the heavy cream. Stir in the remaining flour mixture, mixing just until no streaks of dry ingredients remain visible. Pour batter into prepared pan. Bake for 55-60 minutes, or until a toothpick inserted into the cake comes out clean or with only a few crumbs attached. Allow cake to cool in the pan for at least 20 minutes, then turn out onto a wire rack to cool completely. Pour vanilla glaze (below) over cooled cake, if desired. In a small bowl, whisk together confectioners’ sugar, milk and vanilla until very smooth. Glaze should have a pourable consistency, so add a few extra tablespoons of confectioners’ sugar if it is too thin, or a few extra teaspoons of milk if it is too thick. Looks so fluffy and tender! Looks great. Just wondering, could I use half and half?